Being a parent is often described as the most wonderful and most difficult experience that life has to offer. Bringing home a newborn often gives new parents a healthy taste of both of these things, but both also increase greatly over time. When your child first starts talking, it’s a joyous occasion that is often celebrated with home videos and YouTube uploads. As time goes on, however, your child may begin to talk back, and leave you wondering where all the cuteness went. Dealing with a child that talks back can be extremely frustrating and can even cause you to get angry. Before you get too worked up though, try taking these tips into mind (after taking a deep breath, of course), and then decide how to proceed. The most important thing to consider is why your child is talking back. Are they really being defiant or just struggling to assert their independence in the only way they know how? If your child asks, “Why?” when you send her to her room, is she being cheeky or does she really want to know? Keep in mind that answering questions from your children with, “Because I said so!” will only lead to more back talking. Look at the situation and really define your child’s behavior. 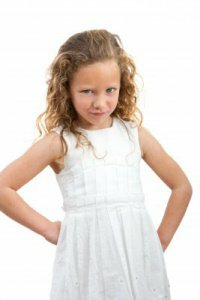 Younger children will often yell out simple insults like, “You’re dumb!” as a means of asserting independence when they are chastised or when they are given an order that they do not want to follow. They are not trying to misbehave, they just want to establish their frustration and let you know that they are independent. Put a little bit of distance between yourself and the situation for a moment and just breathe. Are you really going to argue with your 3 year old? Does it really matter if you win an argument? The goal is not to win a fight but to change a behavior. By arguing back you are doing the exact same thing that they are and actually encouraging the behavior. Take a step back and reassess; what is the best way to get your point across? When your child yells out an insult, you immediately need to let her know that the behavior is inappropriate and unacceptable without turning it into a bigger deal than it is or dwelling on it. It’s often possible to decide ahead of time how you will react to your child and what your course of action will be. It’s generally a good idea to start with gentle guidance before launching right into discipline. While you obviously cannot plan for every outburst (though wouldn’t that be nice? ), you can be prepared so that your emotions do not influence your actions. You must decide; how will I respond to this? If my child screams out, “I hate this!” when you choose an outfit, are you going to ignore him? Remind him that ‘hate’ is not an acceptable word? Are you going to ask why and then attempt to remedy based on his reasons? Different situations will require different courses of action, but deciding your options ahead of time will help you decide what to do when the moment arises. Children need direction; that is what parenting is all about. The entire goal of discipline is to redirect your child to a more appropriate behavior. When your child talks back, the behavior needs to be directed right then. Just like with any other behavior, waiting to address it will do no good and will likely only confuse your child. At first, you may be able to direct your child’s back talking by understanding why they are doing it. As previously mentioned, young kids often talk back as a way of establishing their autonomy, which means that they just need to know that you hear them. If this is the case with your child, make sure that they feel heard and understood all of the time and the need to talk back in order to establish it may slowly disappear. If the behavior continues, firm but simple reminders may be the next direction to take. When your child talks back, remind them that certain words are not okay to use, let them know that talking like that hurts your feelings, or let them know that talking back will result in punishment (be specific about what the punishment will entail). Once you’ve determined that the behavior is not going to stop without discipline, it’s time to break out your creativity. The more creative you are with your child’s punishments, the more they will remember them and will be less likely to continue repeating the behavior. Be sure that “the punishment fits the crime,” as the saying goes. If your child talks back when you ask her to turn off the television, then perhaps you take away her TV privileges; or better yet, remove the television all together. If you threaten punishment as a warning, then you must follow through with it or you’ve lost all control as a parent. Likewise, once you have instilled a punishment, follow through with it. Do not give in, or the behavior will keep returning.